Wordless Wednesday: Artistic Flower – Go ask Alisa – DIY capsule wardrobe one stitch at a time! 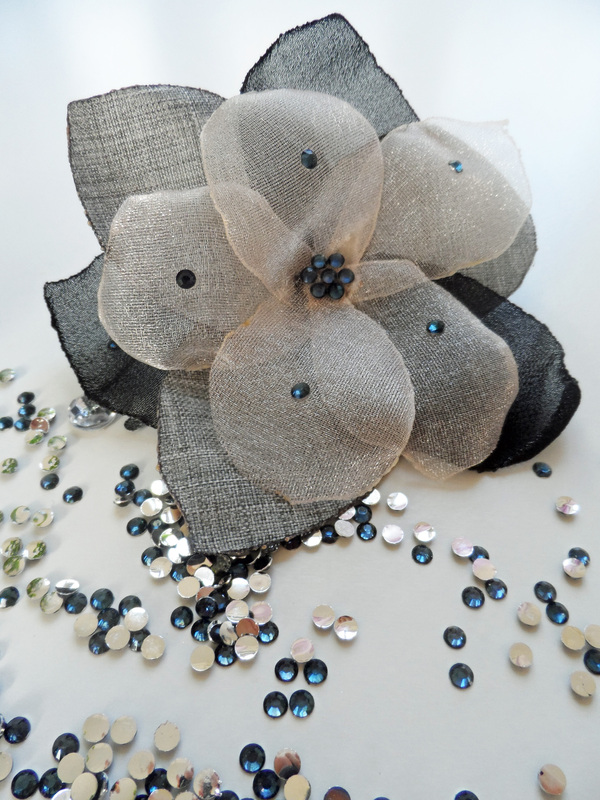 I made this flower out of fabric remnants that I had: grey suiting fabric, black chiffon, soft blush organza and some blue sparkles on top. Pretty nice, isn’t it? What to do: cut out approx. 15 different petal shaped circles out of your scrap fabrics. You can mix and match shades and colors as you wish. When you are done cutting out circles, light up the candle (please be careful while working with fire) and gently finish the edges of petals. You will see that edges of fabric will harden up forming into a beautiful shape. This will allow you to create flower brooch as well as prevent fabric from fraying. When all petals are done start gluing those with hot glue gun to the base. As a base you can choose a plain brooch pin from the DIY store, or you can use any of the round badges you don’t need (this will give you more surface to work with). Glue petals starting with bigger ones at the bottom, finishing the top with the smaller ones. Once done, choose your center piece and glue it in the middle. Make sure you leave no hot glue marks on the fabric. Your amazing flower brooch is ready! You are incredible creative Alisa!